A Corridor Coordinator was nominated for each RIS COMEX Corridor who is responsible for coordinating the actions within the respective Corridor. The Project Management Team was established and consists of the Coordination Team, the Corridor Coordinators and the Activity Leaders. The finalisation of the Grant Agreements were supported and the signature process was executed under the coordination of the Project Coordinator viadonau. The RIS COMEX Master Plan was elaborated, discussed and finalised by the Project Management Team under the coordination of the SuAc 4.1 Lead Rijkswaterstaat providing the list and interpretation of Corridor Services to be investigated and defined within Activity 2 followed by their implementation in Activity 3 (if feasible). The detailed RIS COMEX Work Programme and Dissemination Plan was elaborated and finalised under the coordination of the Project Coordinator viadonau. The RIS COMEX project website (riscomex.eu) was specified and contracted by Project Coordinator viadonau. The detailed organisational structure, SCOM composition, decision finding procedures and other relevant aspects related to joint execution of the RIS COMEX project by the consortium were agreed and defined within the RIS COMEX Consortium Agreement under the coordination of the Project Coordinator viadonau. Furthermore, SuAc 2.1 (CoRISMa Assessment) was executed by identifying and providing all relevant results of the predecessor project CoRISMa and by informing all RIS COMEX partners about the vision, executed tasks and results of that project to bring everyone on the same knowledge level. In a series of Core Team workshops, as well as between these workshops, the Core Team Members under the guidance and coordination of the related SuAc Leaders discussed and further elaborated the Service Definitions. Get Service Definitions approved by 4th SCOM Meeting end of June 2018 in Ruse. Within SuAc 2.5 the architecture, respectively the system concept, is elaborated under the coordination of the German Waterway Directorate. For that purpose also a Core Team was established that met regularly to discuss and elaborate possible architecture types/options based on which the SCOM members made an indicative choice on the preferred architecture at the 2nd SCOM meeting in December 2017 in Rotterdam. Based on the defined Corridor- and Support Services as well as based on the intended preferred system architecture choices by the SCOM, the SuAc 2.5 Core Team further discussed and elaborated on the system architecture. Furthermore, a detailed gap analysis was prepared and executed where each partner had to indicate which services are intended to be realised and what gaps have to be considered on legal (data protection), organisational or data (availability, quality) level. By the end of May the SuAc 2.5 Core Team agreed on a central system architecture reusing an existing system to realise Level 1, Level 2 and Level 3 Corridor Services. This solution will be proposed to the entire project consortium and the SCOM Members are asked to approve this during the 4th SCOM Meeting by the end of June 2018 in Ruse. In parallel, the owner and operator of an existing system that is most suitable from technical and functional point of view to be reused as central system is investigating the possible approach and procedure to do so from legal (procurement, ownership, contracting), financial (costs, invoicing) and other viewpoints in order to further elaborate on that scenario under the assumption that the SCOM will approve this proposal. SuAc 4.2: The legal requirements were investigated and a rough proposal on how to establish a legal basis for the necessary international exchange of relevant information was elaborated and presented to the SCOM. Based on the final agreed architecture and on the feasibility to reuse and existing system for the realisation of the defined Corridor Services, the legal basis has to be prepared and established jointly by all concerned partners under the coordination of SuAc 4.2. SuAc 4.4: A detailed concept for the definition of the quality criteria for the individual Corridor Services and the related data was drafted and has to be further elaborated and finalised as a basis for realisation within Activity 3. SuAc 5.1: A detailed work plan was elaborated and agreed by the SuAc 5.1 partners which was agreed by the PMT by the end of May 2018. A cooperation with leading ECDIS viewer manufactures is under preparation to demonstrate the integration of Aids-to-Navigation into the on-board applications visualising the Electronic Navigational Charts. Furthermore, on national level several partners implement specific measures to provide Aids-to-Navigation to the skippers navigating along their stretches. SuAc 5.2: A detailed national stakeholder consultation was executed by each national project partner under the coordination of the Project Management Team with the main aim to get specific answers relevant for the definition of the Corridor Services directly from the potential future users of these services. 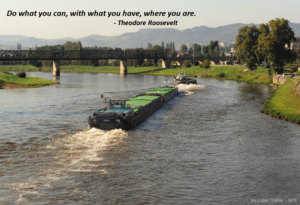 Furthermore, the Project management Team established the so-called Industry Reference Group with representatives of the main European Inland Navigation related Branch Organisations. Three workshops were already organised to inform the IRG about the vision, plans and intermediate results of the project and to get their feedback on individual Corridor Services, their specific needs, requirements and expectations as well some input for a potential prioritisation of these services. SuAc 5.3: This SuAc deals with the definition and provision of necessary Reference Data to enable the defined Corridor Services and with the investigation of a potential support of the Corridor Services towards Statistics. In the course of May 2018, this SuAc was kicked-off by a workshop under the lead of viadonau whereas the detailed planning and specific next steps as well as the differentiation and dependencies to Activity 2 (definition of the Corridor Services and their requirements towards Reference Data) and Activity 3 (Implementation of the Corridor Services including implementation of the Reference Data Management Support Service) were discussed and agreed. Identification of an approach and conditions to reuse the intended existing system as central RIS COMEX solution to realise the intended Corridor Services. External legal advisors are supporting the consortium to identify possible ways for contracting and other organisational issues (ownership, procedure for amendments, etc.). Based on the findings of this investigation INEA has to be informed about the intended approach to clarify the eligibility of the related costs. Ideally this is clarified by the end of July 2018 (latest beginning of September 2018) in order to enable a proper start of Activity 3 in autumn 2018 (whereas it has to be stated that the preparation of Activity 3 already has started in the first half of 2018).